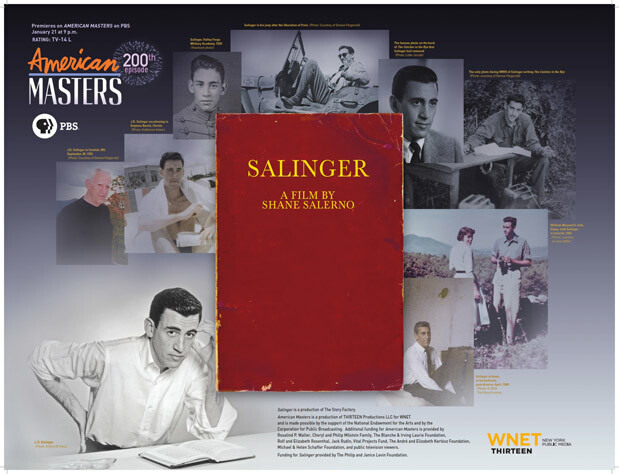 In support of the AMERICAN MASTERS Salinger broadcast, WNET is distributing 30,000 copies of the “Salinger, A Film by Shane Salerno” education poster to schools nationwide. The poster, which can be downloaded here on the AMERICAN MASTERS website, will assist educators in utilizing the PBS broadcast of Salinger as a classroom resource. An activity-based analysis of The Catcher in the Rye and other works by J.D. Salinger as well as a look into his private life are illustrated by essays and classroom activities included in the poster. View and download six pages (8.5 x 11) of the Education Guide. Topics include: Salinger’s Fictional Families; The impact of The Catcher in the Rye; Art Imitates Life; Works by Salinger; Classroom Activities; additional PBS Learning Media resources for James Baldwin, Harper Lee, Philip Roth, Carl Sandburg. View and download the front poster image of Education Guide.